Come, gather and celebrate with other women the Sacred Feminine inside of you. 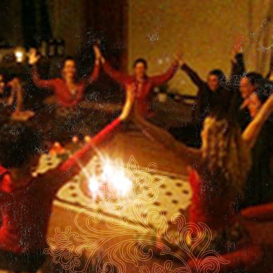 Creating a Yogini Circle is creating a sacred temple space in which we support and seduce each other to go beyond our personal resistances, embracing our feelings of surrender, longing and ecstatic nature. So why don’t you join us and feel the strength and bonding of our circle of women, which in so many countries and cultures has nurtured and supported our spiritual growth. The Yogini Circle will invite you to dance, shake, laugh and roar, to stretch your experience into a deep love relationship with your innermost self, your inner Goddess, the Great Mystery, while stretching our bodies and minds into new and exciting possibilities!